Go To Town 3 is a fun racing game by Biceps. You were alone in a dangerous island, you have to collect materials to build a boat and get to the city. But in the island you are waiting for different difficulties. In the city you can earn money and buy different cars, Ride a motorcycle, quadrocycle and admire the great beauty of the city. 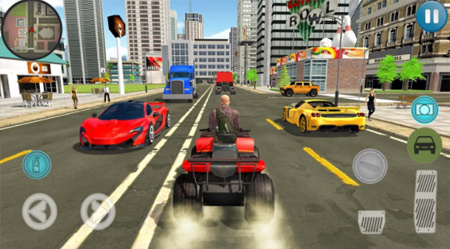 The game features fantastic graphics, beautiful city landscape, and easy controls. If you get stuck in the game, check out the video walkthrough and gameplay for the game. This entry was posted in Android Games, iOS Games, Mobile Games, Walkthrough and tagged Go To Town 3 Cheats, Go To Town 3 Gameplay, Go To Town 3 Guide, Go To Town 3 Hints, Go To Town 3 Review, Go To Town 3 Solutions, Go To Town 3 Strategy, Go To Town 3 Tips, Go To Town 3 Walkthrough by Marvin. Bookmark the permalink.